Within a few meters beneath the earth surface, three distinctive soil layers are formed: a top dry and hard layer, a middle moist and soft region, and a deeper zone where the mechanical strength of the soil increases with depth. The information of this subsurface soil is required for agricultural, environmental, civil engineering, and military applications. 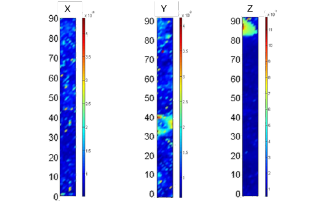 A seismic surface wave method has been recently developed to non-invasively obtain such information (Lu, 2014; Lu, 2015). The method, known as the multichannel analysis of surface wave method (MASW) (Park, et al., 1999; Xia, et al., 1999), consists of three essential parts: surface wave generation and collection (Figure 1), spectrum analysis, and inversion process. The implement of the technique employs sophisticated sensor technology, wave propagation modeling, and inversion algorithm. The technique makes use of the characteristic of one type of surface waves, the so-called Rayleigh waves that travel along the earth’s surface within a depth of one and a half wavelengths. Therefore the components of surface waves with short wavelength contain information of shallow soil, whereas the longer wavelength surface waves provide the properties of deep soil (Figure 2). 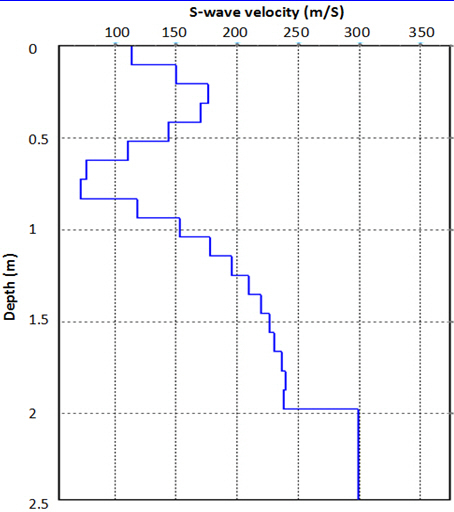 The outcome of the MASW method is a soil vertical profile, i.e., the acoustic shear (S) wave velocity as a function of depth (Figure 3). 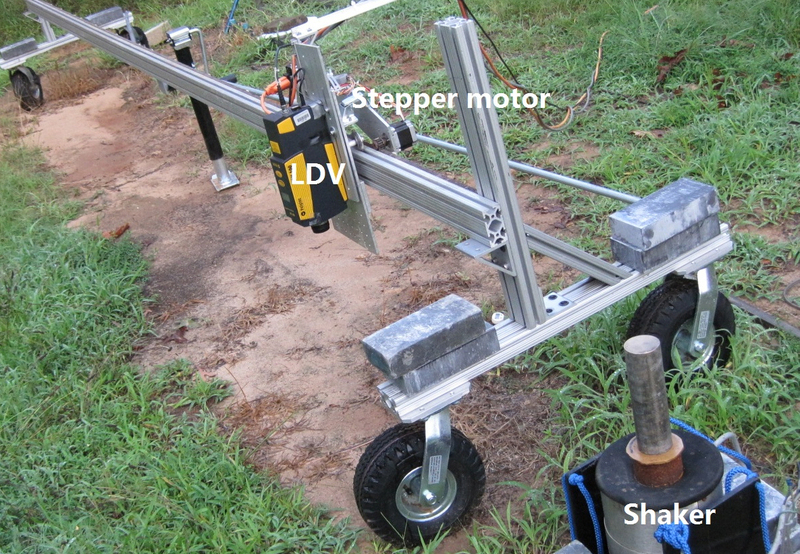 By repeating the MASW measurements either spatially or temporarily, one can measure and “see” the spatial and temporal variations of the subsurface soils. Figure 4 shows a typical vertical cross-section image in which the intensity of the image represents the value of the shear wave velocity. From this image, three different layers mentioned above are identified. Figure 5 displays another two-dimensional image in which a middle high velocity zone (red area) appears. This high velocity zone represents a geological anomaly, known as a fragipan, a naturally occurring dense and hard soil layer (Lu, et al., 2014). The detection of fragipan is important in agricultural land managements. The MASW method can also be applied to monitor weather influence on soil properties (Lu 2014). Figure 6 shows the temporal variations of the underground soil. This is a result of a long term survey conducted in 2012. By drawing a vertical line and moving it from left side to right side, i.e., along the time index number axis, the evolution of the soil profile due to weather effects can be evaluated. In particular, the high velocity zones occurred in the summer of 2012, reflecting very dry soil conditions. Lu, Z., 2014. Feasibility of using a seismic surface wave method to study seasonal and weather effects on shallow surface soils. Journal of Environmental & Engineering Geophysics, DOI: 10.2113/JEEG19.2.71, Vol.19, 71–85. Lu, Z., Wilson, G.V., Hickey, C.J., 2014. 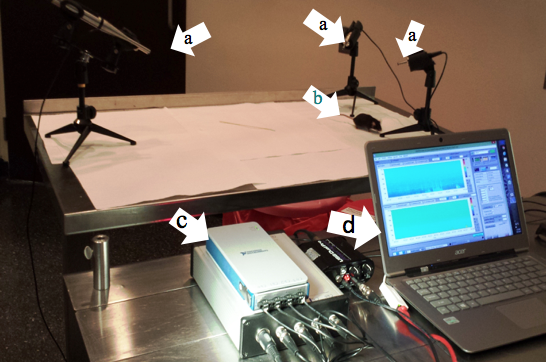 Imaging a soil fragipan using a high-frequency MASW method. In Proceedings of the Symposium on the Application of Geophysics to Engineering and Environmental Problems (SAGEEP 2014), Boston, MA., Mar. 16-20. Park, C.B., Miller, R.D., Xia, J., 1999. 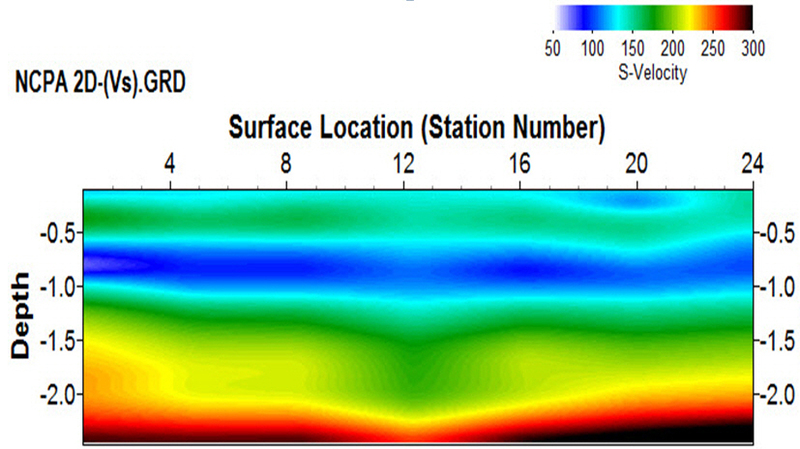 Multichannel analysis of surface waves. Geophysics, Vol. 64, 800-808. Xia, J., Miller, R.D., Park, C.B., 1999. Estimation of near-surface shear-wave velocity by inversion of Rayleigh waves. Geophysics, Vol. 64, 691-700. One common problem in industry is to detect and characterize defects, especially at an early stage. Indeed, small cracks are difficult to detect with current techniques and, as a result, it is customary to replace parts after an estimated lifetime instead of keeping them in service until they are effectively approaching failure. Being able to detect early stage damage before it becomes structurally dangerous is a challenging problem of great economic importance. This is where nonlinear acoustics can help. Nonlinear acoustics is extremely sensitive to tiny cracks and thus early damage. The principle of nonlinear acoustics is easily understood if you consider a bell. If the bell is intact, it will ring with an agreeable tone determine by the geometry of the bell. If the bell is cracked, one will hear a dissonant sound, which is due to nonlinear phenomena. Thus, if an object is struck it is possible to determine, by listening to the tone(s) produced, whether or not it is damaged. Here the same principle is used but in a more quantitative way and, usually, at ultrasonic frequencies. Ideally, one would also like to know where the damage is and what its orientation is. Indeed, a crack growing thru an object could be more important to detect as it could lead to the object splitting in half, but in other circumstances, chipping might be more important, so knowing the orientation of a crack is critical in the health assessment of a part. To localize and characterize a defect, time reversal is a useful technique. Time reversal is a technique that can be used to localize vibration in a known direction, i.e., a sample can be made to vibrate perpendicularly to the surface of the object or parallel to it, which are referred to as out-of-plane and in-plane motions, respectively. The movie below shows how time reversal is used to focus energy: a source broadcasts a wave from the back of a plate and signals are recorded on the edges using other transducers. The signals from this initial phase are then flipped in time and broadcast from all the edge receivers. Time reversal then dictates that these waves focus at the initial source location. Time reversal can also be more that the simple example in the video. Making use of the reciprocity principle, i.e., that a signal traveling from A to B is identical to the same signal traveling from B to A, the source in the back of the plate can be replaced by a receiver and the initial broadcast can be done from the side, meaning TR can focus energy anywhere a signal can be recorded; and with a laser as receiver, this means anywhere on the surface of an object. In addition, the dominant vibration direction, e.g., in-plane or out-of plane, of the focus can be specified by recording specific directions of motion of the initial signals. If during the first step of the time reversal process, the receiver is set to record in-plane vibration, the focus will be primarily in that in-plane direction; similarly if the receiver records the out-of-plane vibration in the first step of the process, the focus will be essentially in the out-of-plane direction. This is important as the nonlinear response of a crack depends on the orientation of the vibration that makes it vibrate. To fully characterize a sample in terms of crack presence and orientation TR is used to focus energy at defined locations and at each point the nonlinear response is quantified. This can be done for any orientation of the focused wave. To cover all possibilities, three scans are usually done in three orthogonal directions. Figure 2 shows three scans on x, y and z directions of the same sample composed of a glass plate glued on an aluminum plate. The sample has 2 defects, one delamination due to a lack of glue between the 2 plates (in the (x,y) plane) at the top of the scan area and one crack perpendicular to the surface in the glass plate in the (x,z) plane in the middle of the scan area. As can be seen on those scans, the delamination in the (x,y) plane is visible only when the wave is focused in the Z direction while the crack in the (x,z) plane is visible only in the Y scan. This means that cracks have a strong nonlinear behavior when excited in a direction perpendicular to their main orientation. So by scanning with three different orientations of the focused vibration one should be able to recreate the orientation of a crack. Another feature of the time reversal focus is that its spatial extent is about a wavelength of the focus wave. Which means the higher the frequency, the smaller the spot size, i.e., the area of the focused energy. One can then think that the higher the frequency the better the resolution and thus higher frequency is always best. However, the extent of the focus is also the depth that this technique can probe; so lower frequency means a deeper investigation and thus a more complete characterization of the sample. Therefore there is a tradeoff between depth of investigation and resolution. However, by doing several scans at different frequencies, one can extract additional information about a crack. For example, Figure 3 shows 2 scans done on a metallic sample with the only difference being the frequency of the focused wave. Figure 3. From left to right: Nonlinear component of the time reversal focus at each point of a scan grid at 200kHz and 100kHz and photography of the sample from its side. At 200kHz, it looks like there is only a thin crack while at 100kHz the extent of this crack is larger toward the bottom of the scan and more than double so there is more than just a resolution issue. At 200kHz the depth of investigation is about 5mm; at 100kHz it is about 10mm. Looking on the side of the sample in the right panel of figure 3, the crack is seen to be perpendicular to the surface for about 6mm and then dip severely. At 200kHz, the scan is only sensitive to the part perpendicular to the surface while at 100kHz, the scan will also show the dipping part. So doing several scans at different frequencies can give some information on the depth profile of the crack. In conclusion, using time reversal to focus energy in several directions and at different frequencies and studying the nonlinear component of this focus can lead to a characterization of a crack, its orientation and depth profile, something that is currently only available using techniques, like X-ray CT, which are not as easily deployable as ultrasonic ones.